UNITED NATIONS, September 2 -- On the day Sudan pushed fighting into Blue Nile State, while being accused of bombing and using food as a weapon in Southern Kordofan, Inner City Press on September 1 asked the US and French delegations consulting on the UN Security Council's agenda for September if Kordofan was on it. Later the President of the Security Council for September, Nawaf Salam of Lebanon, told Inner City Press that the hope is to deal with Kordofan during the pre-scheduled -- that is, regular and routine -- meeting on Sudan. 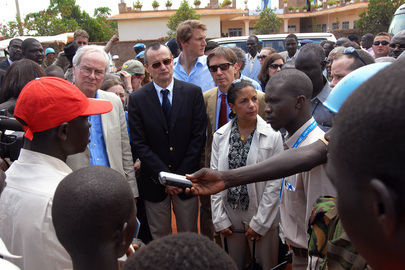 UNITED NATIONS, August 31 -- Even before the UN peacekeepers in Southern Kordofan entirely stopped protecting civilians on July 9 upon the expiration of the mandate of the UN Mission in Sudan, they were criticized for inaction on murders of people including their own employees in Kadugli in June. When Inner City Press asked the Anglican bishop of Kadugli, he said that the UN peacekeepers had sided with government aligned militias. "29. On 8 June, an UNMIS independent contractor (IC) was pulled out of a vehicle by SAF in front of the UNMIS Kadugli Sector IV Compound in the presence of several witnesses, while UN peacekeepers could not intervene. He was taken around the corner of the compound and gunshots were heard. Later he was discovered dead by UNMIS personnel and IDPs." When asked about the phrase "UN peacekeepers could not intervene," UN officials including now former Department of Peacekeeping Operations chief Alain Le Roy emphasized that the report could still be changed. "17. On 8 June, an UNMIS individual contractor (IC) was pulled out of a vehicle by SAF in front of the UNMIS Kadugli Sector IV compound in the presence of several witnesses. He was taken away from the vicinity of the compound and gunshots were heard. Later he was discovered dead by UNMIS personnel and IDPs." Inner City Press asked now former deputy spokesman Farhan Haq about the deletion of the phrase and was told to "ask Navi Pillay." 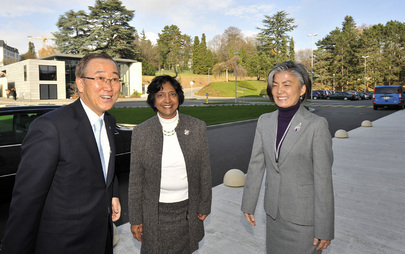 As Pillay and an entourage left the UN Security Council on August 19, Inner City Press stopped her and asked about edits. "She has an appointment," a staff member intervened. "We will e-mail you an answer." "draft para 29 / final para 17: original phrase 'while UN peacekeepers could not intervene' is ambiguous. Does it mean they were not ABLE to? If so was that for circumstantial reasons, or because of rules of engagement? Or does it mean they chose not to? After checking with the field, we were unable to establish the precise circumstances, so the reference was deleted." For UN peacekeepers to fail to act during killings, important in this instance to no less that the Bishop of Kadugli and previously of interest from Srebrenica to Rwanda, should not be left ambiguous -- but it should definitely not by deleted, by the UN. The Office of the High Commissioner for Human Rights could and should have determined what were the rules of engagement for these UN peacekeepers, and should have addressed the allegations by the Bishop of Kadugli and others that the peacekeepers decided not to act because they sided with Khartoum and its militias. To delete the reference and airbrush out the peacekeepers is, in this view, entirely irresponsible. So too, some feel, has been Pillay's silence on the UN at least twice flying in a UN helicopter Southern Kordofan's governor Ahmed Haroun, indicted by the International Criminal Court for war crimes. In this context, to air brush out inaction by UN peacekeepers in the same geography appears even worse. Another edit involved moving where Sudanese Central Reserve Police moved arms from inside to outside of the UNMIS Protective Perimeter. "42. On 8 June, UNMIS Human Rights witnessed the movement of four armed men (two armed civilians and two Central Reserve Police) carrying weapons in and out of the UNMIS Protective Perimeter without any intervention from the UNMIS peacekeepers guarding the premises." "30. On 8 June, UNMIS Human Rights witnessed the movement of four armed men (two armed men in civilian clothes and two Central Reserve Police) carrying weapons in and out of the IDP area situated outside the UNMIS protective perimeter." "draft para 42 / final para 30: Change made because checking process suggested factual error regarding location of movement of arms, which in turn cast a very different light on behaviour of UNMIS troops." Beyond the seeming emphasis on exonerating the peacekeepers, one wonders even if the movement of arms by Central Reserve Police was "outside the UNMIS Protective Perimeter" but still witnessed by the UN, why did the UN not act, and was the peacekeepers' presence airbrushed out of the final report? Entirely taken out were two paragraphs about the Sudanese Red Crescent, since accused of filling mass graves and lighting the corpses on fire. "53. As of the morning of 20 June, there were about 11,000 IDPs in and around the vicinity of the UNMIS Protective Perimeter, most of whom had come from Kadugli and its immediate environs. In an attempt to force these IDPs to return back to their homes, it is believed that National Security agents, donning Sudan Red Crescent vests, came to the UNMIS Protective Perimeter and requested all the IDPs to relocate to the Kadugli Stadium by 17:00 that same day where they would be addressed by state authorities on the security situation and where they would be provided basic services including shelter in schools. Human Rights verified this allegation through multiple interviews of IDPs within the UNMIS Protective Perimeter. 54. UNMIS Human Rights also observed a well known National Security agent wearing a Sudan Red Crescent reflective vest intimidating IDPs. When approached and questioned by UNMIS Human Rights the agent identified himself as a NSS agent and said he had received instructions from state-level authorities to move out IDPs from the UNMIS Protective Perimeter. IDPs interviewed said that they were informed by Sudan Red Crescent personnel that they must evacuate the Protective Perimeter by 16:00 and that they feared the Central Reserve Police would evacuate them forcibly if they did not leave the premises." "removal of draft paras 53-54: After fact-checking, we did not feel we could substantiate the allegations in these two paragraphs. This does not necessarily mean they were not true -- just that we did not have sufficiently solid evidence to include them at the time we finalized the report." Has OHCHR gotten more information since it finalized the report? And what of the line that UN "Human Rights verified this allegation through multiple interviews of IDPs within the UNMIS Protective Perimeter"? Did these "multiple interviews" not take place? Did witnesses later recant? If so, why? OHCHR and the UN should still explain this, particularly in light of what has since come out about the Sudanese Red Cross, which President Al Bashir now says is the only group permitted to provide aid in Southern Kordofan. Colville, again to his credit, had more to say, including about other OHCHR reports about Abyei and the Democratic Republic of the Congo. His full response about the report and edits is here.